Located in the heart of the Denver Technology Center with easy access to I-225 and I-25 is the TO&A Denver Tech Conference Center. This landmark building is only 30 minutes from the Denver International Airport and just 20 minutes from downtown Denver. In addition to a grand lobby entrance, walking trails and picnic areas, the Center boasts spectacular views from all sides of the building. Our TO&A court reporting clients have access to four conference/deposition rooms and a beautiful board room, all fully furnished and equipped with the latest in audiovisual technology. 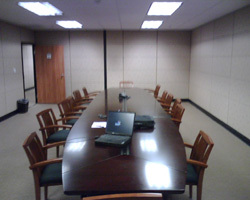 Videoconferencing is available upon request. Expert onsite litigation staff offer friendly, professional assistance for all your court reporting needs. Close by are many upscale hotels and restaurants for casual and fine dining. The center is located across from the Belleview Promenade Shopping Center and the DTC Public Amphitheatre.